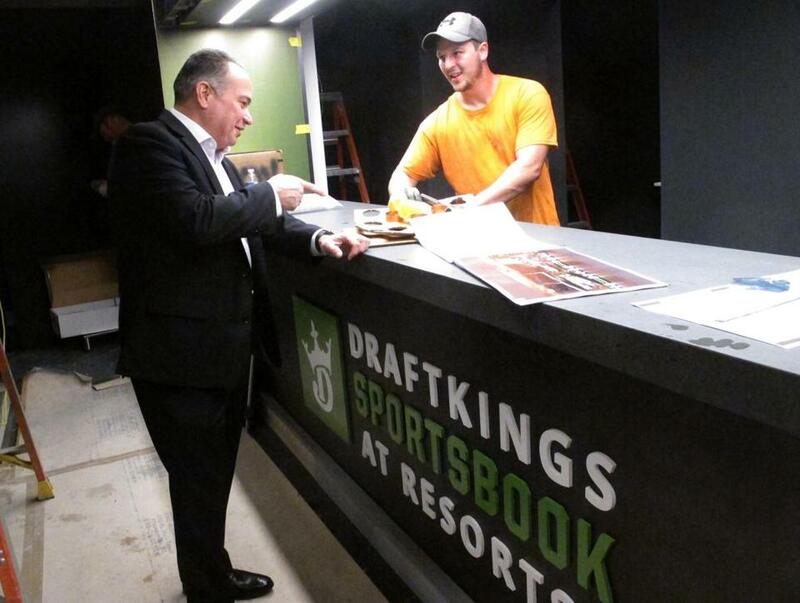 Mark Giannantonio, president of Resorts Casino in Atlantic City, N.J., spoke with a worker about progress on the casino’s new sports betting facility it will open with DraftKings on Nov. 20. ATLANTIC CITY, N.J. — DraftKings and Resorts Casino are firing the latest shot in New Jersey’s sports book arms race, with a full-fledged sports betting facility due to open in a week. The two companies said their 5,000-square-foot sports book will open on Nov. 20 in a space off the casino floor where patrons walk in off the Atlantic City Boardwalk. It is the latest ambitious offering in a scramble by New Jersey casinos, racetracks, and bookmakers to have not only an online and mobile phone operation, but also a go-to game-day physical facility to attract and hold fans as they bet, eat, and drink. Six of the seven Atlantic City casinos that offer sports betting are operating in smaller temporary quarters with plans to expand to full-blown sports books in the coming months; the Ocean Resort casino debuted a fully built sports book within days of opening in June. Likewise, the Meadowlands Racetrack in East Rutherford, just outside New York City, opened a full-scale sports book with FanDuel when it began operating in July, and Monmouth Park Racetrack in Oceanport built a sports betting lounge in a room just off the track’s main betting area. Since New Jersey began taking sports bets in mid-June, over $336 million has been wagered on sports here. The push for physical sports books has cost millions of dollars and created hundreds of temporary construction jobs. Mark Giannantonio, president of Resorts, said 150 workers have been building the DraftKings sports book for 2½ months at a cost of several million dollars. Resorts and DraftKings, the daily fantasy sports company and recently minted bookmaker, have partnered for online sports betting since August. The new sports books are designed to be much more than a place to watch a game, order a beer, and make a bet. The most ambitious of them feature walls of gigantic video screens showing multiple games, plush leather chairs with cellphone chargers, and VIP areas with bottle service. The Resorts facility will offer short rib empanadas, chipotle quesadillas, and jalapeno cheddar fries. A sushi bar is opening right next door to it. The Golden Nugget’s sports book serves game-day breakfast Saturday and Sunday mornings.